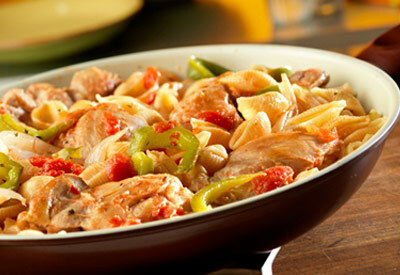 The pasta cooks in the same skillet along with the chicken, veggies and a simmering tomato sauce... what could be better? It's tasty and clean up's a breeze! Heat the oil in a 10- inch skillet over medium-high heat. Add the chicken and cook for 10 minutes or until well browned on both sides. Stir the broth, oregano, garlic powder, tomatoes, green pepper, onion and black pepper in the skillet and heat to a boil. Stir in the pasta. Reduce the heat to low. Cover and cook for 15 minutes or until the pasta is tender.